CPG Group specialises in assaying, refining, casting, minting, buying and the selling of precious metals such as gold, silver, platinum and palladium. We also manufacture a wide range of gold and silver cast and minted bullion bars for the Australian bullion market and fine gold and silver granules for the Jewellery manufacturing industry. 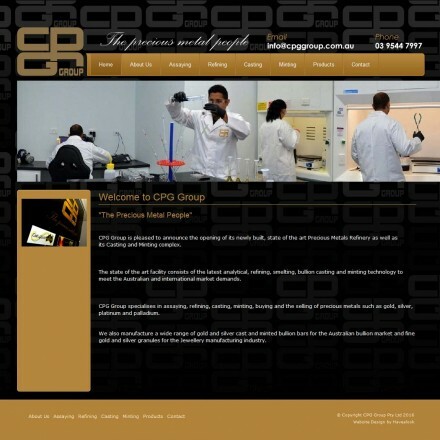 CPG Group are a long-established full service precious metals dealer covering every step of the process from scrap gold buying and assaying, to refining, casting and minting both investment grade bullion and precious metals products for the trade. Part of a successful family of companies each catering to a specific element of the precious metals market, CPG Group takes these services and offers them together from a single point of contact. When doing business with CPG Group - please say you saw them in Bullion.Directory. Read or add CPG Group reviews and ratings using the "reviews" tab above. All CPG Group details are believed to be correct at the time of listing. Please report errors here. I’ve had a few dealing with this group as I use to sell scrap gold to them and I started to refine my gold with them and I’ve had a great relation with their staff, they are very professional and honorable business to deal with, I trust them 100%. I would recommend them to anyone in the trade.